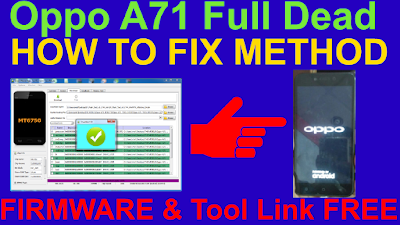 Home / How To Fix Oppo A71 Full Dead 100% Tasted Method. / videos / How To Fix Oppo A71 Full Dead 100% Tasted Method. How To Fix Oppo A71 Full Dead 100% Tasted Method. Oppo A71 Full Dead Recover Required File. Download Oppo A71 Cph1717ex Firmware. Download Sp flash Tool New. Oppo A71 Dead Fix Method. 1# DOWNLOAD All File Unzip..
2# INSTALL MTK CHIP USB DRIVER. 3# OPEN SP FLASH TOOL. 4# NOW SELECT FIRMWARE ON TOOL. 5# GO TO FORMTE TAB & CLICK FORMTE. 6# PRLOADER UNTICK AND FLASH. 7# NOW SELECT ONLY PRELOADE AND AGAIN FLASH PRELOADE. 8# NOW YOUR OPPO A71 DEAD PROBLEM FIX DONE.